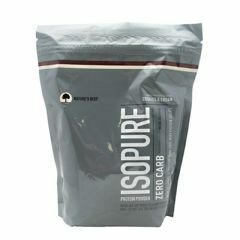 AllegroMedical.com presents The Nature's Best Zero Carb Isopure - Cookies & Cream Protein Supplement. 50 grams protein per serving. 100 % whey protein isolate. 10,900 mg BCAA's per serving. Lactose free. 4.6g l-glutamine per serving. 600 calories. Instanized. We're all more than muscle. Lean mean carb free machines. 50 grams of 100% pure whey protein isolate and not a carb in sight. And it still comes with glutamine and nutrients, but no lactose or impurities, so it's easy to drink. Your gut will agree. For a delicious, fruity drink, mix 2 scoopfuls (61 g) with 12 fluid ounces of water in a shaker or blender. If a shaker or a blender is not convenient, Isopure can be stirred into solution with a spoon. Drink one serving daily. Ion Exchange Whey (Milk) Protein Isolate, Microfiltered Whey(milk) Protein Isolate, Vitamin/Mineral/Amino Acid Blend (Taurine, Potassium [as Potassium Chloride], Chloride [as Potassium and Sodium Chloride], Calcium [as Dicalcium Phosphate Dihydrate], Phosphorous [as Dicalcium Phosphate Dihydrate], L-Glutamine, Magnesium [as Magnesium Oxide], Vitamin C [Ascorbic Acid], Vitamin E [as Dl-Alpha Tocopheryl Acetate], Niacin, Zinc [as Zinc Sulfate Dihydrate], Vitamin A [as Palmitate], Pantothenic Acid [as D-Calcium Pantothenate], Vitamin B6 [as Pyridoxine Hydrochloride], Copper [as Amino Acid Chelate], Manganese [as Manganese Sulfate Dihydrate], Riboflavin, Thiamin [as Thiamin Hydrochloride], Folic Acid, Biotin, Iodide [as Potassium Iodide], Chromium [as Amino Acid Chelate], Vitamin K, Molybdenum [as Amino Acid Chelate], Selenium [as Amino Acid Chelate], Vitamin B12), Soy Lecithin, Natural and Artificial Flavors, Caramel Color, Sucralose.